DANGER MOUSE | Warped Factor - Words in the Key of Geek. This year, to mark his 34th anniversary, Danger Mouse is returning to screens. Revamped, revoiced, redrawn and reinvigorated, everyone’s favourite super-spy will be back to save the world. But what is it that makes Danger Mouse worth reviving? Why does everyone who’s seen him have such fond memories of the mouse with the secret base, the flying car, the cowardly assistant and the eye-patch? What is the secret of Danger Mouse? The idea was originally to parody the likes of Patrick McGoohan’s Danger Man and eventually James Bond, by having the world’s greatest secret agent be a mouse, defeating ludicrous schemes by other animal characters to take over the world, most notably ‘terrible toad’ Baron Greenback (can we say Goldfinger? Although he more resembled that other classic Bond villain, Blofeld). The episodes were ten minute comedy tales that owed as much in tone to the Goons and Monty Python as they did in material to the superspy genre – the banter would be fired off at a rapid rate, with occasional pauses for ‘that makes no sense’ revelations, and either cost-cutting or wantonly funny techniques such as characters running off the edge of the film or dropping down holes just to fall through the ceiling of the same shot. As we recently said of Bananman, the time for Danger Mouse was very very right – there was a movement towards genre-inverting comedy, with Douglas Adams’ Hitch-Hiker’s Guide To The Galaxy parodying serious science fiction, Terry Pratchett’s Discworld novels parodying serious po-faced fantasy, Bananaman himself parodying straight comic book heroes and the like. Cosgrove Hall – the animation firm who introduced the world to fairly demented children’s show Chorlton and the Wheelies and the potentially drug-riffing Jamie and the Magic Torch, and would go on from Danger Mouse to carve out something of an empire of delicious silliness in animated circles, felt the mood of the time, and picked on the ludicrously over-complicated plots of superspy shows and movies as a fertile ground for mickey-taking. 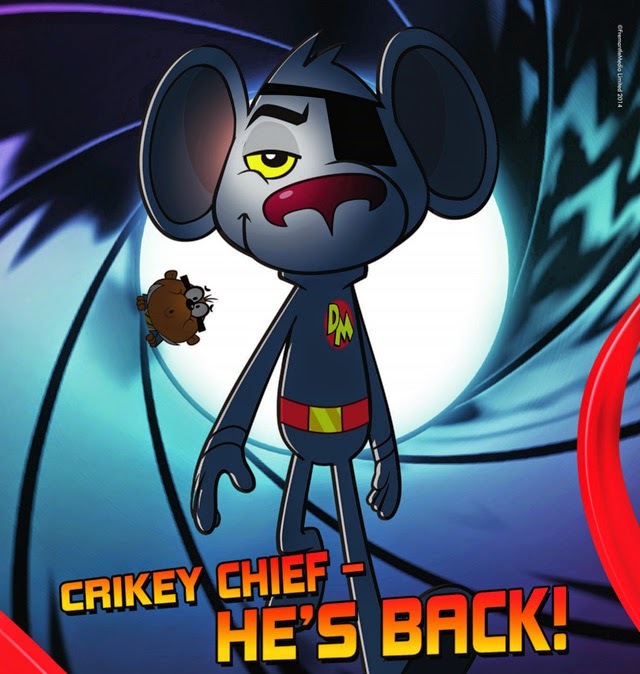 Over ten series, Danger Mouse, his cowardly assistant Penfold, their boss Colonel K and a host of other characters would unite to foil the plans of animal evil, most usually embodied by Greenback and his cronies, building an increasingly demented world of adventures. The announcer, also voiced by Danger Mouse voice David Jason, began to develop, in the style of Wallace Greenslade during the Goon Show’s history, into an integral part of the show, with his own personality, problems and dilemmas as he voiced the framing narration to Danger Mouse’s adventures. Colonel K, never seemingly the brightest chinchilla in the litter (yes, really, that’s what he was), grew increasingly absent-minded over time, and, aware of the central planks of a children’s fandom – give us the money shot! 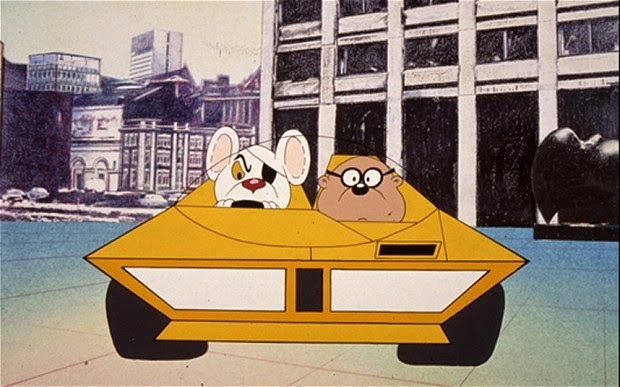 – a minute of each adventure, at least, would be spent getting from Danger Mouse’s secret base in a Mayfair pillar box, down the equivalent of the Bat Poles – a sofa that shot away down through the floor and dumped DM and Penfold in their car – and then showed that car escaping and flying off into action. The whole scene was a direct rip from the 1960s Batman series, where each episode had to have its Bat Pole, Bat Cave, Batmobile racing off into adventure moment – and in a ten minutes show, the re-useable footage was a positive godsend. 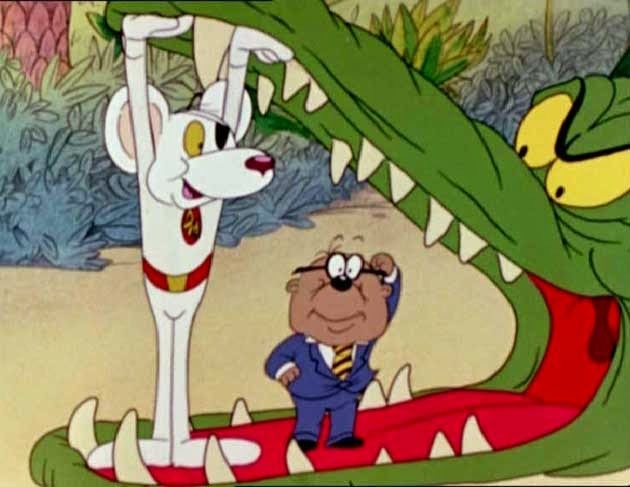 So Danger Mouse caught the mood of its moment – bringing generations of silliness to bear and introducing it to a children’s audience where, bizarre as it may sound, it had never been intentionally targeted before. Despite thousands of children glued to wireless sets for the silliness of the Goons or wearing the grooves out of their Monty Python albums, it had never been considered an acceptable thing to do before the 80s to actively be intelligent and silly in a children’s programme. Danger Mouse (and Bananaman!) to the rescue! Beyond that, tribute must be given to the writing of Brian Trueman, who penned most of the scripts for Danger Mouse over the ten series. Bizarrely, geeks of a certain age might remember Brian Trueman as ‘that bloke who fronted Screen Test when Michael Rodd gave it up,’ but behind the camera, Trueman’s true wit was allowed to shine in the rapid-fire back-and-forth banter of the Danger Mouse world. Of course, all the witty writing in the world is no use whatsoever if you don’t have a cast who can make it fly. Fortunately, Cosgrove Hall snagged two of British comedy’s incomparable stalwarts, with Terry Scott (of Carry On, Terry and June and Much Else Besides fame) giving us the archetypal cowardly bureaucrat in Penfold, and David Jason, of Porridge, Open All Hours, the Hitch-Hiker’s Guide and most famously Only Fools and Horses, voicing the world’s bravest mouse, as well as his own announcer (and technically Greenback’s pet caterpillar, Nero – never let it be said that Cosgrove Hall didn’t squeeze value out of their actors). Between the two of them, with help from Edward Kelsey (Colonel K and Baron Greenback) and sometimes Trueman himself, they kept the interactions swift and sharp and delivered with the perfect pitch to make 80s children whoop with laughter, even if they had to think about it for a second first. In addition, Cosgrove Hall at the time was full of young animators, themselves inspired by the likes of Terry Gilliam in Monty Python, unafraid to experiment, or indeed to be wantonly silly (in one space-faring episode for instance, they added a still of a London double-decker bus, long before such a thing was ‘legitimised’ in audio adventures by Iris Wildthyme). There was a sense of freewheeling adventure and fun about the design and development that complimented the madcap scripts and perfectly pitched performances. So essentially, Danger Mouse embodies a perfect storm of comedy animation – the moment, the writing, the animation and the cast all coming together to create something truly special. 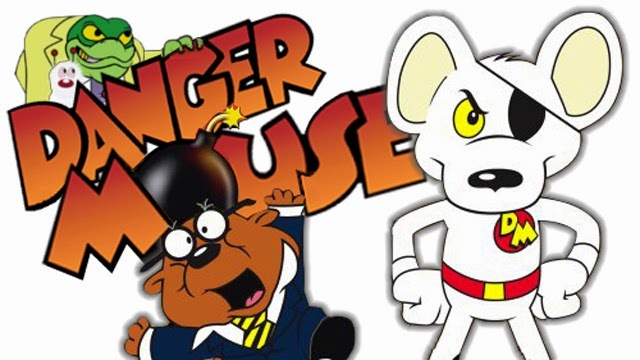 The impact of shows like and including Danger Mouse has continued to be felt ever since (as an aside, you can try and convince me that without Danger Mouse, we’d still have had Pinky and the Brain if you like. Good luck with that). The comedy inversion of serious geeky culture proved its power, and made it alright to be into geeky things, as long as they were funny geeky things – a trend which so far has lasted over thirty years and has survived, for instance, the resurgence of Star Trek and the po-faced Federation and the rise of George R R Martin’s Game of Thrones. Programmes like Danger Mouse, and books like those by Adams and Pratchett, helped shift geek consciousness to a point where self-referential (but never ever self-reverential) humour is an essential part of geek culture. And soon, before you know it in fact, Danger Mouse will be back – this time voiced by Alexander Armstrong, with comedy support from Kevin Eldon as Penfold. As casts go, it bodes well. But to stand up to the madcap joy of the original, the new Danger Mouse will need not only to feed the appetite of geeks for funny spy stories. It will need to be as inventive as the original, and take the humour forward once again or risk a Wombles or Magic Roundabout-style watering down of the currently unassailable memory of Danger Mouse. So – no pressure, then. Catch the new Danger Mouse when it airs later this year. Or spend a significant portion of your remaining geeky life catching up on the ten original series – available at Amazon now.